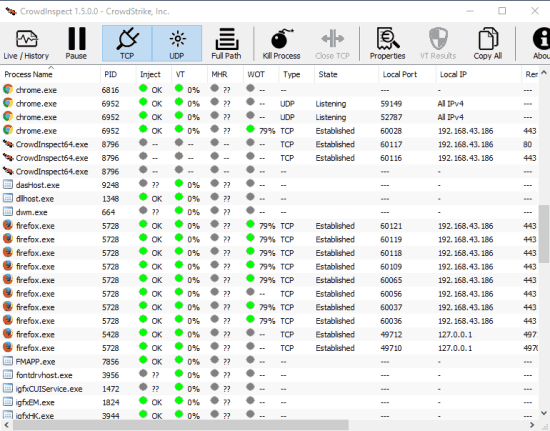 CrowdInspect is a free software to check running processes for malware in real-time. 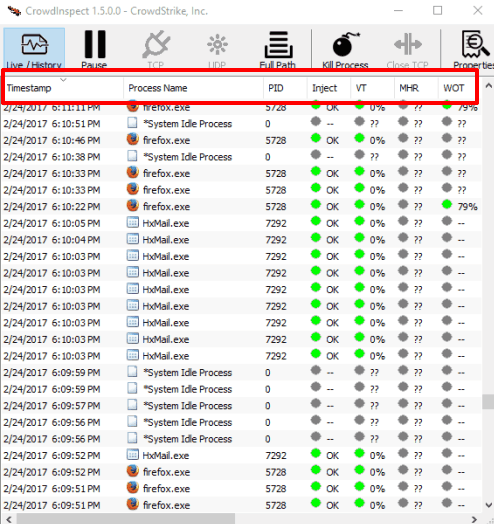 It shows the list of all the running processes (system processes and other processes related to third party software) and checks if any of those processes is unsafe. The software shows VirusTotal report and Web of Trust (WOT) level of each individual process. This helps to find if a process can cause threat to your PC or it is OK.
Apart from these two important parameters, the software also checks hash value of a process (with the help of Team Cymru Malware Hash Registry) to find if it is suspicious. A couple of other information is also provided on its interface. You will be able to find network connection of a process (if any), type of network connection, Local port and IP (if process is connected to network), remote IP and port, DNS server, and open VirusTotal report of a process directly on VirusTotal page on your default browser. It doesn’t provide option to export the report of all or some processes. However, you can copy all the details and then paste it in Excel, Notepad software, or somewhere else. The exported details can be used for technical assistance or later analysis. In the screenshot above, you can see interface of this software where it shows detailed information related to each individual process. You can also pause real-time scanning as well as resume it anytime. This is a portable software and light on system resources. You can get its zip file using this link. When you launch this software, it will start collecting information related to all the running processes. After that, you can view all the details on its interface. It shows process name and a lot of other information. Check Web of Trust level: This helps to find if process has a good reputation or not. The green color and 100% level indicates the process is good. Check VirusTotal Report: It is helpful to find if a process contains malware. Here also, the trust level is measured in percentage (0-100). 100% indicates the process is safe. Code Injection Detection: Code injection detection status is used to check if attacker has injected some code to make program vulnerable. For some processes, it showed the OK report. However, for some other processes, it wasn’t able to detect the status. So it won’t be good to completely rely on it. Network Connection: It helps to check if a process is connected to local or remote network. If yes, then it shows the type of connection (TCP or UDP), local port, remote port, and remote IP. Show/Hide Live History: Use this option to display scan timestamp (date and time). These are the features that cover main things this software provides. You can view the information carefully, copy it, and then save it. Some basic options are also available that you can use. For example, you can show/hide full path of processes, kill any process, and open properties window of any process. Task Manger and other similar software can give you the list of running processes and help you kill any process, suspend, access properties, etc. However, such software might not be able to tell if a process is threat. There is possibility that some harmful process might be running on your PC and your antivirus software hasn’t detected it. So before a process can do any type of harm to your PC or data, software like CrowdInspect can be given a try. It’s a very simple tool yet useful to check running processes for malware in real-time.